Learn more about seamless Time Tracking and its configuration. Why seamless? There are no extra steps required to start your timers! Simply drag a task to your working column and the timer will start itself, and as soon as you're done - it will stop automatically. To start the timer, simply right-click on a task and select Start Timer or drag it to an appropriate, working-type column. For more information regarding the configuration of a seamless Time Tracking triggered by card movement click here to see our guide. The Time Tracking will display on the right side of your board in the side-panel, under the My Work for today. Upon starting any timer a task will enter the My Work for today feed on the right and you will see an ongoing timer. You can pause and start your cards manually in this side-panel. Task name - click on the name to open your task. Timer - a running or paused timer. When you click on it, a detailed list of all your time entries will drop down. You can edit the time by pressing a timer entry or remove it by pressing the bin icon. Card color - easily see what card type you are working on. Your work flow and time tracking efforts can be evaluated with the Time Report. To view it, please go to Analytics, and then Time Report to access Summary Report and Detailed Report of your time entries. Click here to learn more about the Time Report. Configuration of Time Tracking is quite easy and only requires a few modifications in your board settings. To set up your Time Tracking, please go to Settings - Board editor and edit the Lane types in each column setting. There are three possible lane types which will trigger an action for your timers. Queue / Waiting - Idle columns in which the timer will pause. In progress - Your working column in which the timer will start. Done - Finished your work? Pulling cards into this column will stop the timer and remove it from the list. The most important are In Progress / Working and Done / Finished columns. These will allow you to start benefiting from time tracking without any additional actions in your daily work. All you will have to do is move the card to your column and the timer will start itself. Nothing changes! In your board editor edit the working column and select the In Progress lane type. Now modify your Done / Finished column in the same fashion. Set the column type to Done and confirm your choice. Set all remaining columns to Queue / Waiting if you wish the tasks to pause upon entering. Once you are done with your lane types you are ready to use our seamless Time Tracking! You can always start the timers manually or simply drag the tasks to proper columns. How do I edit my time spent? Forgot to turn off the timer? Need to add an entry for when you were away from your office? 1. While in your board view, the right side panel - My Work for today - will display all recent timers. You may click on the timer to expand the full list of time entries. You can remove any by pressing the bin icon or edit an entry by clicking on it. A date picker window will pop up and you will be able to set date, starting and ending time. Note: If a task was not timed at all, and is therefore not listed in My Work, in order to add a time entry to it, right-click the task and choose Add to My Work, then press play on it, so that a time entry appears. After that, edit the entry, as described above. 2. You can also edit your timers in the Detailed view of the Time Report. In the Detailed report you will be able to see all Time Tracking entries. If you are an Account Owner you can modify and remove any entries by clicking the icons to the right of each row. If you are just a regular user, you will be able to edit and remove your own entries only. 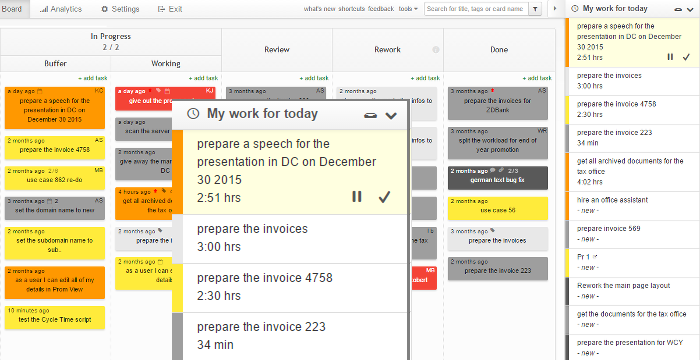 My Work widget is what allows you to display your upcoming tasks across multiple boards in one place. From there you can sort them in accordance to your preference - day plan - and postpone by a specific amount of time (hours, days). Please note that the My Work widget is available for Enterprise plan users only. 1. 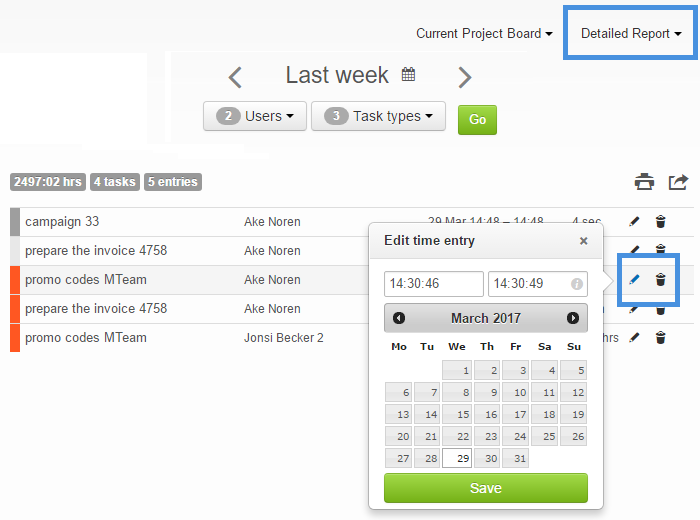 The widget is displayed on the right-hand side of your Kanban board. 2. To add tasks to the My Work list, please right-click a task and select "Add To My Work". That's all. Also, when someone else assigns a task to you, it will appear on this list. To sort tasks by your own preference, just use drag and drop. 3. The timer on the task starts right when you move the task to an "In Progress" type of column, or - if there's more tasks in there already and you pick one of those - when you right-click on it and select "Start Timer". Once you've completed a task and moved it to the "Done" column, the timer will stop automatically and the task will then disappear from the My Work widget. You can pause it at any time. 4. My Work widget also allows displaying the subtotal amounts of time spent on each task. This is accessible by clicking the time elapsed record. Doing this opens a list of all subtotals. They are also available to view in Time Report - just make sure to open the Detailed Report view. 5. The name of the task will appear in a bold format, when there's been a new comment made in the task and also when the task comes back to the list after being postponed. 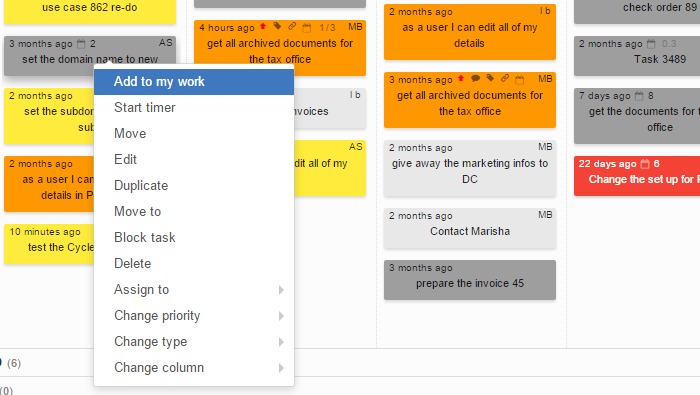 This widget allows displaying tasks from multiple boards - clicking on a particular task in My Work widget will take you to the Kanban board, that the task is from. 6. Also, if someone assigns a checklist item to you, a task to which this checklist belongs, will be added to My Work widget - and will appear in bold, so that you know there's been new activity that concerns you. A Summary Report - allows a view of important statistics and summaries of the work flow. A Detailed Report - view a detailed list of all your records. Furthermore, you can export your reports to a PDF file and print them out or simply save it to a CSV file. The printer and export buttons are located just below the bar graph in case of Summary Report and on top of the list in Detailed Report. 1. A Summary Report will give you all the significant information about your team's activity. Boards - select boards for which the reports should be generated. You can select as many boards as you want. Time interval - press the arrows to move your statistics by weeks. Click on the small calendar icon in order to set your custom time interval. Users - check the users whose records you want to see in your reports. Task types - choose the task types that you want to take into consideration. Tags - filter your reports by tags. 3. The bar metric will display the total time spent each day on your chosen tasks. Each bar is a separate day and the height indicates the time spent. 4. The Breakdown Chart will display a pie chart according to your filters. You can group it by users, tasks, boards or swimlanes. Those can be further grouped by the same attributes. If you click on an item in the left hand side list, a list of secondary items will expand. All of that can be sorted by name or duration. 5. Keep in mind that you can click on each element of a Breakdown Chart to view more detailed bar graph. 6. A Detailed Report will display a detailed list of all your timers. 7. You can filter your results in the same way you were able to filter your Summary Report. On the top left you will see a sum of time spent, number of tasks and total number of entries. Every time you start and pause your timer you are creating a new entry. 8. Also here, you can manage your entries. If you are an account administrator you can modify and remove all entries by clicking the icons to the left of each row. If you are just a regular user, you will be able to edit and remove your entries only. Why are there diagonal lines moving across some tasks? This is a result of a running timer-indicating feature, which will show these diagonal animations for every task on the board that is currently being timed. This goes for both the task you and the other team members are timing. To learn more about using the Time Tracking, please visit this page. When sharing work on a task, how do we know how much time each of us has put in? 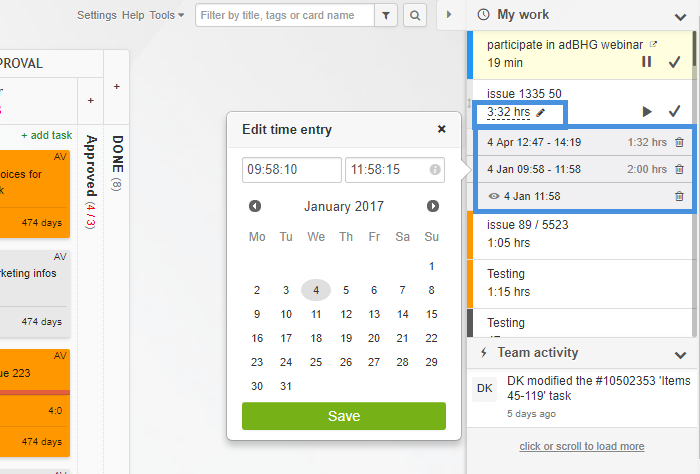 For a quick view of user-specific time input on a task - turn to the Time log. Available on an open card - it brings a quick insight into how much time different people have been working on a task. Further information on this subject can be read form the Time Report.